Influenced by the rhetoric about U.S.-Mexico border issues and the living conditions of asylum seekers stuck in border camps, Rosenstein wanted to see the situation for herself. She also wanted to do what she could to provide medical care to the steady flow of migrants—lack of medical care is a persistent problem for this ballooning population. A concrete border fence separates most of San Diego County from Mexico—the squalor of the sprawling Tijuana tent camps sits in stark contrast to the lush prosperity of its American neighbor. In one of the camps, Rosenstein saw people urinating and defecating in the open near those who were ill laying on concrete in the hot sun, and a man with an obvious leg wound wandered futilely seeking help. “That was my initial encounter. It was real. And it was horrifying,” she recalls. With a grueling 15-hour day ahead, the volunteers split into two clinical teams. Rosenstein’s team spent the first part of the day in a tent camp and the rest of the day in an LGBTQ safe house. Working with a supervising physician, Rosenstein was able to prescribe medications and treat patients—many cases were unforgettable. Another patient, an eight-year-old boy traumatized from witnessing his father’s murder, had fled El Salvador with his mother. He had post-traumatic stress disorder and suffered panic attacks. They did not seek asylum because the boy’s mother refused to be separated from her son—she thought the safest place for them was a Tijuana tent camp. But physical violence in the tent camps is common and hostility toward LGBTQ people makes that population especially vulnerable. In fact, prior to Rosenstein’s arrival, several LGBTQ people in the tent camps had been murdered. One of her patients in the LGBTQ safe house was a trans-woman—a vicious beating in her home country had left her with severe facial injuries that required surgical reconstruction. By the time she sought asylum her face had healed leaving little evidence of the beating—border agents wanted proof of her injuries. Without access to x-rays to prove the extent of her injuries, asylum was denied. She describes a man she met who had lived in America for most of his life—he arrived as a child—but was deported after an ICE raid. With no family or friends in Mexico and no place to live, he was staying in the tent camp while trying to figure out what to do. “This situation is not uncommon with ICE raids taking place nationwide, even here in New Hampshire and Vermont,” she notes. Rosenstein has always possessed strong political views but became an ardent activist after the presidential election of 2016, “For me, citizenship mean acting where you can.” She participated in the 2016 Women’s March in Washington D.C. shortly after the election. She has protested the Muslim travel ban, and has been involved with advocacy and civil disobedience related to immigration and family separation policies—she took part in a sit-in with U.S. Senators Tammy Duckworth (D-Iowa) and Kamala Harris (D-California) in a Congressional office building in Washington, D.C. Everyone was arrested. 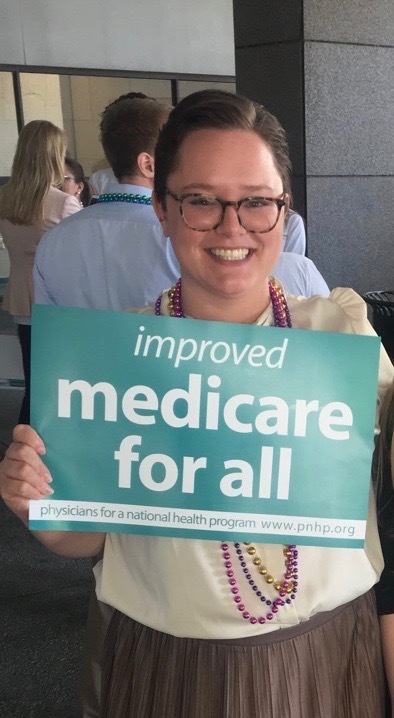 At Geisel, she founded Students for a National Health Program, an organization whose members testified before the New Hampshire state legislature on behalf of a single-payer healthcare bill. She hosts dinners and staffs a health resources clinic at the Upper Valley Haven and volunteers at WISE—an Upper Valley organization advocating for an end to gender-based violence—where she mans the crisis line and accompanies people who have been sexually assaulted to the hospital. What she saw in Tijuana was difficult to witness, but Rosenstein believes it was a privilege to be able to help fellow human beings. She is planning to spend this summer participating in Casting for Recovery, a program that helps enhance the quality of life for women suffering from breast cancer by taking them on fly fishing retreats, and working on her public access television program, Voices for Justice, where she discusses the intersection between medicine and social justice. She precepts at a Federally Qualified Health Center in Vermont that serves people on Medicaid and those who are uninsured and plans on a family medicine residency in rural medicine after medical school. “As a student leader for Med Students for Choice, I’m also an advocate for family planning and want to provide the full spectrum of care for women seeking those services, including abortions,” she says.